I got a new toy yesterday and I’m so happy. I’ve wanted one of these since I saw one in a gardening catalog a few months ago, and I finally found one in a local nursery on the 10% off Senior’s Day so we got a deal on it. It’s a Mini Dragon Weed Eater and it uses flame to kill weeds. It’s amazing! What used to take hours of backbreaking labor now takes a few minutes of hot fire. Wow! I really do try to keep up with the weeds in our garden. I’m always pulling them out when they’re small so they don’t get too big as to be too much work. But one side of the yard is infested with serious grass and I just can’t get in to pull it out. So I’ve gone in a few times a year trying to get to them. I can only do this in the late spring or fall when the trees are bare so I can get at them. That time is now folks! We first tried using a regular propane torch like you use for soldering and it work OK but it had such a small area of fire that it would have taken ages to do it. Plus it’s too hard to get back inside of the plants at the back of the bed. So we decided it was time to go for the real thing. Off we went to the nursery and got the Weed Dragon Mini version. There’s a larger one that has a tank on a cart with 10 feet or so of hose so you can do big jobs. But for our little garden this mini one is just perfect. It has a super hot fire and a large outlet and just wilts the leaves in place immediately. Just a few passes and it’s over. They say that you just need to flash over the weeds with a flame and it kills them but I was more intense and actually burned them to the ground where I could. The wand makes it easy to get in behind the Pine and other plants that are too dense to really garden under so far back in the bed against the fence. I had to be careful so as not to burn the fence and we kept a jug of water handy all the time just in case, as you can see in the picture. I showed the whole Weed Dragon as it first came from the box, and then with the tank on. It’s just one of the little 1 pound ones you see for propane stoves and such. It’s lightweight and easy to balance in your hand and you have to hold it at a 6:00 to 8:00 position or it’ll flame out so you have to use some care with it. Don’t want to lose the flame or start a fire! I’ve shown some photos of what it looks like to actually use it and how far the flame will reach and spread out or how it will pin point and get really hot in a certain place. I shot several photos of the weeds after I burned them out and you can still see some green but it’s fading fast. I did these all yesterday and this morning you can see the weeds still sticking out from the edge of the filler, but they’re dying you can tell. So all we have to do is go back a couple times a year with the Weed Dragon and top off the area near the fence and the filler. Anything that tries to come up again will be fried and won’t bother us again, and if it does we’ll fry it again. No mercy for these grasses I’m afraid. Just using it right now in the back of the bed has been a tricky job but I think once I get more used to the Weed Dragon I’ll be able to use it closer to some of the plants and kill more weeds that way. But I’m being cautious at first. Don’t wanna catch any pine needles on fire! The timing for this is pretty remarkable for me personally. On Monday my back went into spasm and I couldn’t walk that night. So I got some acupuncture on Tuesday and yesterday I felt OK enough to do the work, but it got me in the end and last night I went into spasm again. Sigh. This hasn’t happened in years and I’m a bit worried about it. So one more pass and we’re done with the weeding in this area for the year I hope. We have another bad patch in the back that we want to try it on too and it’ll save us untold hours of hard work that will now be easy to do. The Weed Dragon is advertised as being organic and doesn’t use herbicides and will still kill the grasses. It seems like a win – win to me. These cost around 60 bucks, which is a lot, but I think it’ll be worth it for the saving on our bodies over time. I’m sure we’ll find other uses for it too as time goes on. They work to defrost driveways or walks and it can be used for that too. It’s a very versatile tool. I hope it does work as well as advertised and as it seems to do so far. If so we’ll have cut our weeding time back a lot. Yay for appropriate technology! 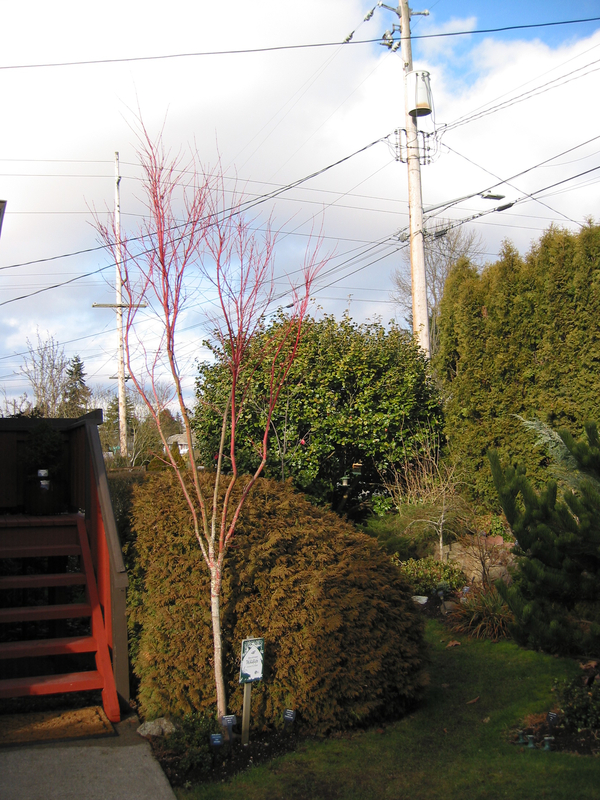 I’ve been itching to get my shears out and prune these Japanese Maples for some time now. There’s some controversy about just when is the “proper” time to prune these delicate creatures. I tend to follow the advice of Cass Turnbull, of Plant Amnesty, a Master Pruner here in Seattle. She says the best time is basically “when the shears are sharp”. In other words you prune them when you’re ready to do it. You have to be in the right frame of mind to do these trees. They can be messed up so easily if you make the wrong cuts. I have spent literally hours gazing at these two trees to determine just which branches to cut and why. My goal is to prune so that you can’t tell that I’ve even done it. I suppose you’re wondering why I put up these two shots. After all you can’t tell anything can you? I sure hope not. If you can tell I’ve just pruned a couple of buckets of branches off the two of them then I’ve done a poor job. If you could see them up close you’d see a scar or two of course but otherwise I think you can’t tell. We were lucky to have a perfect day today for this work. It’s been sunny and warmish, for Seattle anyway, with no rain, another rare occurrence just lately. And I just felt good about it today. I was in the right frame of mind and felt prepared to do it and suffer the consequences if I screwed up. But I don’t think I did. They look just like I had in mind for them to look when I was done. I pruned several other things in the yard but the prostrate rosemary that half froze to death isn’t that pretty right now and the Pfitzer Juniper didn’t fit my theme of maples so I’m not showing those. I did a bunch of other chores around the yard since it was so nice out and I was in the mood. I’ve really been wanting to do some gardening and it’s just been too wet recently so I’ve put it off. So today when I got home from an appointment I put on my pruning gear and got myself prepared. I sharpened my shears and got out the buckets and bins to put the prunings in. I spent an little time just looking at the trees again to make sure I was ready for this and I got out the tall pruning ladder so I could get at the top of the bigger one and off I went. The top shot is of a Japanese Maple, or Acer palmatum, called Sangokaku or Coral Bark Maple, for its reddish new bark. It means Pillar of Coral in Japanese, or Sea Corral to be precise since that’s what it supposedly reminds folks of there. It gets about 25 or 30 feet tall and grows in this vase shape tho I’ve emphasized it and made it tighter since it’s between two paths and we need to be able to walk under it. The other one is an Acer palmatum dissectum called “Waterfall” we just got about a year ago. It was pretty low to the ground when we first got it and I had to prune quite a bit last year. Over the past growing season it put on a lot of growth and so I had to do some more work on it today to keep it off the Rhodie in front of it and keep it in good shape. It may get to 10 feet tall they say and as wide. I’ll have more pruning to do in time. 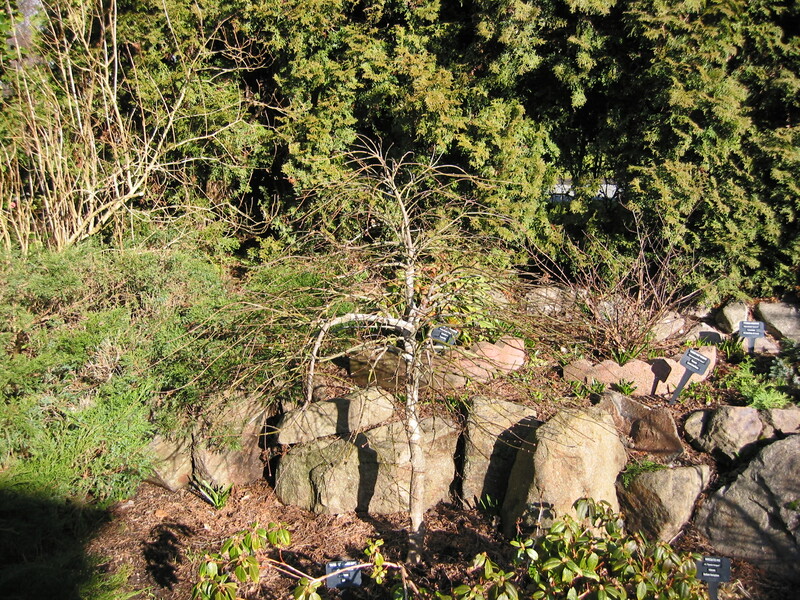 I have 4 other Japanese maples in this garden and the rest of them don’t really take any pruning to speak of yet. They’re growing very slowly, except for one I’ll profile soon, and just can’t handle any loss of limbs. I’m waiting for them to gain some size first before I attempt to prune them much and some of them will probably never need much pruning. I’ll get to them when it’s time. I have pruned them a bit tho and you can’t tell at all that I’ve even touched them it’s so subtle. That’s the way I approach most of my pruning. I’ll try to be as subtle as I can so you can’t tell what I’ve done. It’s like how when you clean a house it just looks right when you’re done, you can’t tell you cleaned it actually and done any work. Good pruning can be like that. You can’t see it. I was taught to prune by a few talented people in my youth and one of them gave me a motto I love. He said he did “Aesthetic and Therapeutic Pruning”, a phrase I’ve used ever since. This practice means that you take into account the nature of the plant you’re working on and allow it to be itself as much as possible, with minor adjustments to keep it in shape and healthy as well as beautiful. It’s a great way to think about it. I don’t believe in topping plants if there’s any other way to prune them. But sometimes it’s necessary. I almost lost a big Viburnum rhytidophyllum a year or so ago and thought it was going to die so I topped it way back and tied it up and in a few months it started to grow again and is a gorgeous shrub that looks grand now. You can see where I cut it still but that will disappear in time as it’s an evergreen so will cover up its scars. But it’s rare I’ll do something that radical unless I’m trying to save a plants’ life, which was so in that case. But topping trees is often a tragedy and I really try to talk people out of it if there’s any other way to go. Often it’s more work to do it right I’ll admit, but you end up with a plant that has it’s natural form instead of bare arms sticking up out of the jungle of suckers that will come on after you top something. It looks like hell to me and I hate it. There are better ways to do it if you just look closely and see where to cut it. Anyway, that’s enough about pruning for now. I know that as time goes on I’ll have many more plants to prune in this garden that have yet to mature. But I hope I’ve done a good enough job of planting them with enough space to grow that I won’t have to do a whole lot of pruning to keep them happy together. Time will tell but if I can do it so you can’t tell I’ll be happy. And so will the plants! PS: Here are a couple of posts I’ve done on pruning before: https://gardeningingreenwood.wordpress.com/2012/12/12/plant-amnesty-says-stop-topping-trees/ and https://gardeningingreenwood.wordpress.com/2012/11/19/some-thoughts-on-pruning-and-size/. Both have some redundant material but new stuff too, especially about Plant Amnesty, which is so cool I want to share it again… ;). Thanks for reading. I really miss my brother. We were just the two of us growing up and tho we didn’t always get along great we loved each other a lot. He was my best friend and my best enemy, as it often is with brothers. It’s been over 4 years now since I lost him and the pain is still sharp at times, and a dull ache at others. It’s hard to lose someone as close to you as a brother, especially a younger one and the only one you have. He was an artist and I have a nice collection of his paintings from early in his life when we all lived together on an old homestead in the High Sierras in central California. He painted many paintings of the place we lived and every time I see them on our walls I’m reminded of better days when he was OK and healthy as a horse. Sometime in the mid-80s he was diagnosed as having HIV antibodies in his system. He refused to go to western doctors, or should I say he tried to go to them but they all said he was just going to die so he quit their death rants and started on Chinese Medicine. He used Chinese herbs to alleviate his condition for many many years and kept himself healthy for a long time – over 20 years. But he was also Bipolar like me, only he wouldn’t get a check up and get diagnosed till the end of his life and it started to eat away at his brain sometime in the early 2000’s. He slowly developed dementia and by the time he died he was barely there much of the time. I spent the last few months of his life first going to CA to get him back and then going to the hospice we put him in when we got him home to Seattle. I can’t say enough good things about Bailey Boushay House here in Seattle. They are truly wondrous caring compassionate people and they made his last days so much better than they might have been. I visited him almost every day for over 2 months till the end and I’m so glad we had that time together. It was very hard being with him but I loved him so much, and he loved me back, and that made it OK to be there. I lost him on Oct. 2, 2009 in the middle of the afternoon. I wasn’t there yet but a close friend of his was, and he sang him to sleep and let him slowly pass on in peace and harmony. It was a “good death” if there is such a thing. He wasn’t in pain and suffering like he had been for so many years and for that I’m grateful. But I’ll always miss him so much…. Sigh. A little about this tree itself… It’s a weeping copper beech tree and it’s parent covers much of Europe. This is a garden cultivar that grows to maybe 10 feet tall or more with a mounding habit. I’ve trained it up to about that 10 feet now and expect it to mound up on itself and become more broad as time goes on. It’ll eventually have to be pruned to let us pass it when we go thru the gate next to it. I’ve been amazed at how fast it’s grown here. Maybe a foot or more a year which surprised me as I thought they were slow growers. I guess it likes it here. Maybe it’s because of all the attention I give it. I spend a lot of time with this tree, just admiring it and thinking of Randy. Even now it makes me cry to think about him. It’s a living memorial to him and it’s the only one like this I have in my garden. So that’s about it. I didn’t talk about the tree so much as I did my brother. I guess I needed to do that. I honor his memory by writing this and I wish you all had a chance to know him as I did. He was such a creative guy and so loving and kind. I wish there were more people like him in the world. It’d be a much better place. This is a bit of a different sort of post for me. I usually show you my garden, but today it’s covered in snow and tho it’s beautiful I thought I’d do something about the neighborhood instead. We went for a walk early this morning in the new snow and seeing the kids at the park made want to do a bit of a photo essay on the joy and excitement I saw there. So I went back home and got my camera and Louie and I walked back around the whole park and I shot photos of it from various angles as we went along to give a sense of perambulating the park and seeing it from many perspectives. I started at the corner nearest our house, just a coupled 0f blocks away, and went from there in a clockwise arrangement and took pictures. There’s lots of kids in this neighborhood and it seemed like they were all out there playing in the snow today. It’s so rare that we get enough to do this that everyone was taking advantage of it. I know that for many of you this seems silly. But for us it’s a big deal and we make the most of it when we get it. It’ll be gone in a day or less according to the weather reports, so we have to enjoy it now. If any of you had any doubts about the fact that I’m a bit obsessive about this garden this post will certainly prove it. I have a small garden so I look very closely at it all the time. I’m always checking things out to see if there are new things happening in the garden, and usually there are. Especially now as we begin to turn into Spring. I follow what’s often called a Celtic Calendar, which may or may not be true in fact, but it works well for me. I start spring at the beginning of February, as it seems to be the time when I see things beginning to sprout and bud out and begin to grow. I figure the Equinox is actually mid-spring as we’re well into it by then and things are in full swing. So then May 1st is the start of summer. Summer solstice is Mid-summer to me and august 1st begins the Autumn time. It goes thru the Equinox as its center point and then winter begins at Halloween and has its mid point at the winter solstice. In each case we go into the season and come out of it it again in the space of the time allotted. It makes a lot of sense to me and seems to work well where I live tho it may not fit other climates at all. So here are some shots of what Spring looks like at this time of year for me in this garden of small delights. And I do mean small. Some of these pictures are so hard to see that even with the slide show it’ll be difficult to see why I’m so excited. But if you look closely you’ll see what I’m seeing and why I’m so amazed about it all. Starting off is an easy one – a Camellia japonica which is huge and loaded with buds. There are quite a few just starting to open and they look fine. This plant is in the tea family – the Theaceae and is related to commercial tea shrubs, which are called Camellia sinensis. I have a few of them in the greenhouse I’ll show to you someday. The Candytuft, or Iberis, is in the Brassicaceae, with the mustard family crops we grow in the veggie garden like broccoli and cabbage. It’s already starting its early bloom season out by the mailbox in front of the house. It turns pure white when it’s in full bloom. Next is one that’s actually been blooming for awhile but I wanted show it since it’s so nice now. It’s a Mahonia Charity in the Berberidaceae family, the barberry family along with the next plant, the Oregon Grape. You can just see the small buds at its tips on this plant if you look closely. It’ll have the same yellow flowers with dark blue berries the birds love. The bees like the flowers too. Next is a simple primrose in the Primulaceae that decided to begin blooming this early for a change. It’s an anomaly as they usually don’t do it this early but I guess it is so I’m happy with it… The next two are cheaters because they’re in the greenhouse. This first is a Persian cyclamen, also in the Primrose family, that has such lovely blooms now. The other is a beautifully scented plant called a Freesia that grows in the garden usually but it looked bad so it’s receiving attention in the greenhouse now. It’s doing well as you can see. Following is the classic Winter Daphne, with all its frost burned leaves from the 14 degree weather we had a few weeks ago. It’s covered with new buds along the stem and even has a few bloom buds turning pink at their edges if you look inside it. It’s the sweetest thing in the garden when it blooms and it’s truly intoxicating. It’s in the Thymelaceae family. This one you really have to look closely at. It’s a bed of naturalized Columbine seedlings that are growing nicely and will form quite a good patch of them in a bit. I love them even if they are a nuisance at times. They’re in the Ranunculaceae family, with all the other Ranunculus. Next is another teeny tiny one – a small Lupin that I think must be a Russel’s hybrid since it’s coming back where I put some last year. It’s a biennial in the Fabaceae, the Legume family, with peas and beans and all sorts of stuff we need to fix nitrogen in the soil. It’s got beautiful stocks of blue flowers in summertime. Here’s the Hellebore, or Lenten Rose, that so many folks are seeing now in their gardens. This one started out as a Mardi Grass pink and put out some seedlings that are pure white so I get both colors when they bloom. They’re just starting and I cut them back this year to allow for lots of new growth. They’re in the Ranunculaceae along with the Columbines. This one is an evergreen Clematis called Clematis armandi which will have sweet smelling white blossoms in a few weeks. It’s growing along the fence line and will get too big where it is but it’s so established I’m just going to have to live with it. I hope it does OK and thrives in this watery spot… It’s also in the Ranunculacea. Now we come to a few Ericaceous plants. How could I not include them? First is a heath called Kramer’s Rote that is in almost full bloom now. It’s so nice in the heather garden as it gives us blooms in this time of year whereas the heathers proper bloom in summer. Next is a Lily of the Valley shrub, Mountain Flame, with some buds just starting to open. It blooms very early and is beautiful with its dark wine red buds. The next is a simple Huckleberry, a native of the mountains of the PNW. You can just see the buds as they’re forming here and are ready to push forth sweet pink blossoms that will turn into tart blue black berries in a few months to feed the birds. We even get to taste a few of them… The last ericaceous one is a Leucothoe that is just starting to set its bloom buds as you can see at the ends of the branches. They’ll be white and smell a bit sweet. So that’s the tour of early Spring. I know these things I’ve shown are very subtle at times but that’s part of their charm to me. I love to see things like this when they are just beginning to grow and see them in their infancy. It’s so exciting to see things starting to grow again in this garden and I hope that things are going to start soon for you too, tho I know it’s not true for many of you covered in snow as you are. I sympathize. We’re due some snow in a day or two ourselves but it won’t be much. It’ll still get cold and we’ll still have snow and rain and all the rest of the winter type circumstances. But it’s Spring now to me and I’m having a blast with it. I hope you are too!